Jake Brewer and Erika Javage wake up every day going to their dream jobs in the sports footwear and apparel industry. Brewer works in the Human Performance Lab at Brooks, and Javage is in the Global Operations Concept and Product Testing Department for Apparel at adidas. Both earned their Master’s degrees from the School of Kinesiology at Auburn University in 2016 under Wendi Weimar, Ph.D., professor and director of the Sport Biomechanics Lab. 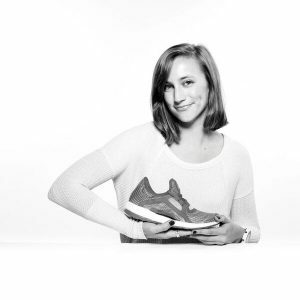 Brewer is a full-time intern in the Human Performance Lab at Brooks Running in Seattle, Washington, testing running shoes. Javage works full-time as a Concept Testing Manager for apparel at the adidas North American Headquarters in Portland, Oregon. In the lab at Brooks during his six-month internship, Brewer is testing new, cutting-edge products that have not yet been released. 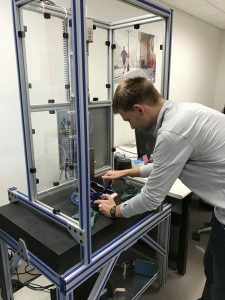 Specifically, Jake tests the cushioning and flexibility properties of the shoes and reports his findings to the footwear developers, suggesting changes to the design. While completing his Master’s degree, Brewer worked at Big Dog Running in Auburn, assessing customers’ gait to suggest certain running shoes. This retail experience helped him understand what consumers want and how employees should pitch shoes. The lab experience with Weimar taught him shoe lacing techniques, anatomy, muscle function, lower extremity biomechanics, and how to use many of the same visual 3D software he uses at Brooks. Brewer said he is trying to learn as much as he can from the experience and the industry. His ultimate goal is to stay on at Brooks with a full-time job after his internship. He said biomechanics plays a big role in runners and athletes, and its role in footwear development will only get bigger. Javage first heard of Dr. Weimar and her lab from the Flip Flop study she read in an undergraduate gait analysis class. The focus on footwear really appealed to her. Upon graduation from Penn State with a Bachelor’s in Kinesiology, Javage gained invaluable work experience as she managed a 24/7 fitness facility and worked at a local running shoe store. She moved down South and began her course work towards a Master’s of Science at Auburn in August 2015. “Having comparable work experience, I applied to work at Big Dog Running in Auburn to pursue my dream of designing running shoes for a big company. I met Jake there, who had similar career goals, and started my Master’s as he was finishing up his last semester,” said Javage. They worked together at Big Dog and shared a passion for biomechanics and sports performance research in the footwear and apparel industry. In August 2016, Javage started a six-month full-time internship with adidas on the Sports Science Team in the Future Innovation Department whose job is to dream up footwear and apparel products and concepts three to five years in advance. She worked with the Design and Materials teams and helped recruit subjects for testing new apparel prototypes. Javage’s internship ended early as she transitioned into a full-time role working in Apparel with the Global Operations Concept and Product Testing Department. Javage has helped create a network of test subjects, spanning from local athletes to international, elite athletes. She supports research and innovation in delivering world class product feedback that showcases consumer needs in cooperation with respective functions. In working with such athletes, Javage provides insight from top-performers in order to enhance product experience for all athletes. Much of the innovative work is confidential prior to its release, but Clima Gear and Clima Heat are some of the recent projects that are now on the market. Javage says her biomechanics course work and Graduate Researcher position in the Sport Biomechanics Lab at Auburn enabled her to look objectively at data, despite working with subjective feedback from athletes. She must report to the Global Operations Concept and Product Testing team any opportunities for changes based off the feedback. She hopes to visit adidas Global Headquarters in Germany later this year.